Be sure to RSVP to insure your space! This is a closed workshop for an on-line group that has requested this workshop. The workshop is for those who find themselves in turmoil, pain or fear due to our current cultural and political climate. However, if the agenda below speaks to you, please feel free to contact Carolyn about joining this workshop. Explore the collective transgenerational roots that have brought us to these times. Discover ways to move forward rather than becoming immobilized by fear and hopelessness. Access profound support and resources for holding us through these times. Save the Dates for 2017 Open Workshops! Systemic Constellation Work reveals the inner architecture of the human being and human relationships; thus, opening us to the wisdom and clarity that flows beneath every issue and condition. It allows us to see what has come before and how our present lives are sometimes impacted by transgenerational events and dynamics. The dynamics may have direct influences on the present well-being of the system and individuals within that system. Systemic Constellation Work can help a person see the relevance of life from a different perspective. As we witness and experience the expanded perspective, redirection and resolutions of long standing issues unfold. The experience provides us with the opportunity to move toward healing, wholeness and peace; collectively and individually. This technique emerged out of psychotherapy, family therapy, group therapy, systems theory and phenomenology. Systemic Constellation Work is offered as an enhancement to one’s healing and growth process; whatever, or with whomever, that might be. Many of Carolyn’s clients have participated in her Systemic Constellation Workshops and use it in their on-going work of healing and growth. However, other participants in the Systemic Constellation Work are not on-going clients and are welcome to attend a group or schedule an individual constellation. Belonging and connection to others is an inherent basic human need. 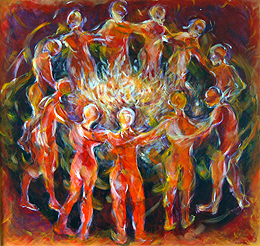 The work acknowledges a “Family or Group Soul.” Furthermore, it acknowledges that the “Family or Group Soul” is held within the “Universal Soul.” It is the material of interconnectedness moving us toward finding purpose and assisting the evolutionary process of the Human Being. The soul, individually and collectively, knows and accepts “what is.” It wants to grow and heal. Participants find clarity in dealing with a wide variety of issues ranging from family issues, to health issues to business/career concerns. The information and perspectives that can be gleaned from this process are often pivotal and transformational in both the short and long term. Many of the past participants in Carolyn’s workshops have informed her of the personal changes and synchronistic events that have occurred in their lives following their participation. A Systemic Constellation Workshop is group work offered in a manner similar to that of role playing. However, the Constellation process creates an experience that is phenomenological in nature; meaning that a phenomenon or happening occurs. A workshop participant can be a client, a representative or a witness during a Constellation. The client states a problem or issue that needs clarity and/or healing. Group members agree to stand in or “represent” a person or aspect related to the client’s issue. The representatives are led, or “informed” by a field that is called a “morphoginic” (Sheldrick) or “knowing” field (Mahr). The representatives have access to knowledge, feelings and awareness that actually belong to the people or aspects they are standing in for; people or aspects they do not know and have little or no information about. The representatives relate to the other members in the Constellation through physical positioning and verbal statements reporting physical sensations and emotions. As a result, the dynamics of the system are depicted. The client witnesses and participates in the safe, gentle experience as the system shifts and moves the client toward clarity, healing and resolution. Group work allows us to serve each other as representatives and witnesses for our individual Constellations. It also allows us to set up Constellations to deal with larger, socially held issues such as issues between men and women, racism, commercialism, etc in a way that serves each of us personally and collectively. Sometimes we need a quiet, one-on-one experience to explore our own field and do our deepest work. Systemic Constellations Work can be highly effective when experienced in a private one-on-one setting. The private experience can be a one time session or you can return as you and your field move, expand and integrate the information and experience of the Constellation. Many people incorporate both individual Constellations and Constellation Groups into their personal journey. The information and experiences in both venues complement and enhance growth, expansion and awareness as all unfolds in prefect timing. It is not at all unusual for someone to set a Constellation in the Group only to have it unfold with more clarity and depth in the personal setting. The process of the Constellation creates an experience that is “phenomenological” in nature–meaning that a phenomenon, or happening, occurs. The phenomenon occurs within an energetic and informational field. During a Constellation, a “morphagenic field” (Sheldrake) or “knowing field” (Mahr) is created. This enables participants to gather knowledge they would not otherwise have regarding what or whom they are “representing”. There is increasing scientific exploration of how transgenerational trauma and knowledge is passed down through family lineage and how it becomes available to us. Epigenetics and quantum physics are finding more and more evidence to lead us toward an understanding of this experience. “This process has become visible through a lineage of philosophers and therapists such as Edmund Husserl the father of phenomenology, Ivan Boszormenyi-Nagy, the pioneer of transgenerational systemic thinking, Virginia Satir who developed family sculpture the precursor of systemic constellations. Bert Hellinger was pivotal in bringing these strands together in the development of this technique.” (ISCA website). Hellinger’s work, along with Hunter Beaumont, Albrecht Mahr and others has resulted in Systemic Constellations; a relatively new, innovative and productive tool for working with systems and the individuals within those systems. "As long as our ancestors are still suffering within us, we cannot be truly happy. If we make a step with awareness...we do this for all the past and future generations. Then all arrive at the same moment we arrive and we all find peace at the same time."